instead of going to the barn today i'm heading into Washington DC to bring my brother some paperwork he needs... definitely way less fun than riding! i'm already booked up the rest of the week, so it had to be today. since he has exams today, Mama Pawlish and i will have to go completely into the city... i'm just hoping we won't be sitting in traffic for hours! 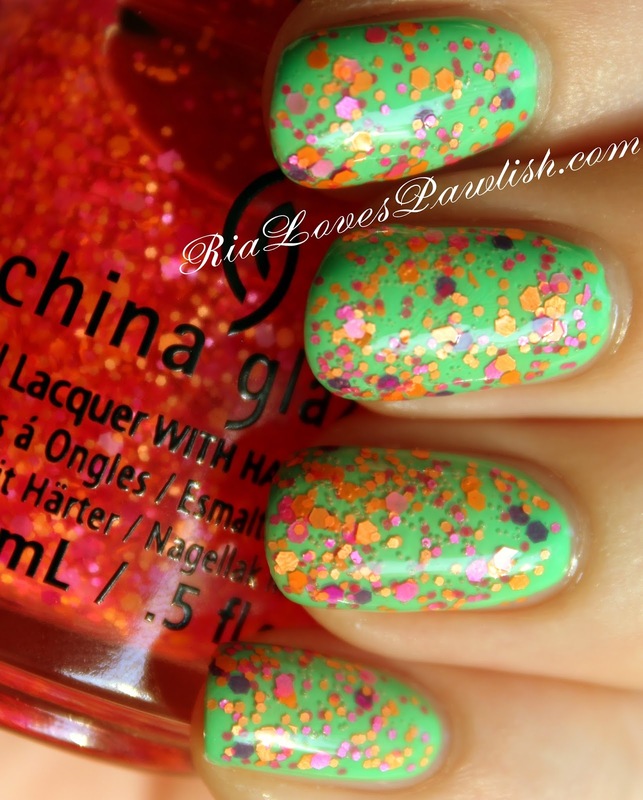 today we have the final China Glaze Electric Nights polish, Let The Beat Drop! (it's a press sample, kindly provided to me for review). it is a differing sizes hex glitter in shades of pink and orange, suspended in a clear base. i applied one coat with some placing to get rid of bare patches... still got some bubbling. i suspect the problem could be with the person doing applying, rather than the polish itself ;) i love it over China Glaze Treble Maker (press sample), the green makes the pink and orange pop. because of the sheerness of some of the pink glitter, it turns purple over the green, adding even more dimension. definitely seal everything in with topcoat! two coats Let The Beat Drop over Treble Maker, finished off with one coat Salon Perfect Crystal Clear Top Coat. (all are press samples). i hope you've enjoyed this look at the China Glaze Electric Nights collection, i'm so thankful for the opportunity to share it! What a fun combo over green!